Western blot analysis of extracts from 293, COS, mouse brain and PC12 cells, using AMPKα (23A3) Rabbit mAb. 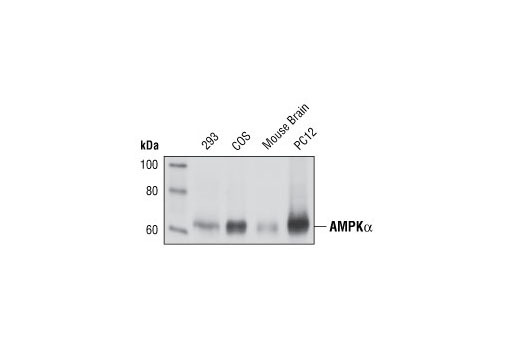 AMPKα (23A3) Rabbit mAb detects endogenous levels of AMPKα protein. The antibody detects both the α1 and α2 isoforms of the catalytic subunit. Monoclonal antibody is produced by immunizing animals with a synthetic peptide corresponding to the amino-terminal sequence of human AMPKα.